Chinese Credit Boom - will it go BOOM? The rate of Chinese debt growth, particularly in the corporate sector and local government sector is now at a level that is drawing attention from ratings agencies to infamous investors like George Soros. The chart below shows credit levels compared to GDP, and the rate of growth of credit (lending) in 5 countries at various points in time that represent 5 years that preceded a credit crisis. (Obviously Chinese credit crisis has not yet happened). This chart shows similarities between China's level of debt and growth in debt in the past 5 years with the US and UK most recently and Japan and Korea in the 1990's. What followed in each of these scenarios was recession. This growth in lending has largely funded Fixed Asset Investment, which is defined as capital expenditure of large items, such as roads, power stations, buildings. If the rate of lending were to slow significantly, this would more than likely disrupt the level of fixed asset investment in China. What does this have to do with Australia? Everything. Australia currently exports vast quantities of commodities such as iron ore to China that is required for their Fixed Asset Investment program. A lower level of fixed asset investment would more than likely result in China importing lower quantities of some of Australia's major exports. The chart below shows that China is now Australia's major export partner. It used to be said that if the US sneezed, Australia would catch a cold. Investors must now consider what happens to Australia if China sneezes. Australia has enjoyed a decade of prosperity on the back of a China construction boom, which is now cooling. Many investments have profited from this. The challenge for investors now is to ensure that their investment strategy now is not anchored in the past. Efficient investment market theory states that as all investors have access to exactly the same information at the same time, there are many well resourced participants, therefore it is impossible for investors to do better than the market. Efficient market theory would work it if weren't for one thing - there is human involvement in the investment making decision progress and humans are hard wired differently and have many different personal biases and traps. Here were begin examining some common investor short comings in a bid to help you reduce the number of mistakes made as an investor. 1. Confirmation Bias - as intelligent people we believe that we make decisions based on researching facts and analysing information. We tend to suffer from Confirmation Bias where a decision is made and then information is sought from sources that support our pre-conceived ideas. 2. Loss Aversion - Humans are highly loss averse. Studies have been done that show people are two and a half times more sensitive to loss than they are to gain. Suppose you had a choice where you can accept a sure $500 or you can face 50-50 odds that you will either win $1,000 or nothing at all. What would you do? Or suppose that you are in the unfortunate situation where you have lost $500. However instead of accepting this loss, you can face 50-50 odds that you either lose $1,000 or you lose nothing. How would you react? In a study more than half the students in this situation would take the chance of losing $1,000 instead of accepting a sure loss of $500. Phychologists emphasise that although people generally behave conservatively when it comes to risk, they are much more willing to take risks when they think they might be able to avert a loss. 3. Framing - is a cognitive characteristic in which people tend to reach conclusions based on the 'framework' within which a situation was presented. This behaviour can result in making poor choices such as selling winning investments rather than realising a loss on a poor investment. For example consider a community preparing for the outbreak of an unusual disease which is expected to kill 600 people. B) If Program B is adopted, there is a 33% chance that 600 people will be saved, and 67% chance that no people will be saved. Results from a conference where this was asked showed that 72% of respondents would choose Program A, despite the fact that the outcome of both Programs are the same. 4. Anchoring - the use of irrelevant information as a reference for evaluating or estimating some unknown value or information. When anchoring, people base decisions or estimates on events or values known to them, even though these facts may have no bearing on the actual event or value. In the context of investing, investors will tend to hang on to losing investments by waiting for the investment to break even at a the price at which it was purchased. Thus, they anchor the value of their investment to the value it once had, and instead of selling it to realise the loss, they take on greater risk by holding it in the hope it will go back up to its purchase price. 5. Over-reaction and Availability Bias - One consequence of having emotion in the stock market is the overreaction toward new information. According to market efficiency, new information should more or less be reflected instantly in a security's price. For example, good news should raise a business' share price accordingly, and that gain in share price should not decline if no new information has been released since. Reality, however, tends to contradict this theory. Oftentimes, participants in the stock market predictably overreact to new information, creating a larger-than-appropriate effect on a security's price. Furthermore, it also appears that this price surge is not a permanent trend - although the price change is usually sudden and sizable, the surge erodes over time. In 1985, behavioral finance academics Werner De Bondt and Richard Thaler released a study in the Journal of Finance called "Does the Market Overreact?" In this study, the two examined returns on the New York Stock Exchange for a three-year period. From these stocks, they separated the best 35 performing stocks into a "winners portfolio" and the worst 35 performing stocks were then added to a "losers portfolio". De Bondt and Thaler then tracked each portfolio's performance against a representative market index for three years. Surprisingly, it was found that the losers portfolio consistently beat the market index, while the winners portfolio consistently underperformed. In total, the cumulative difference between the two portfolios was almost 25% during the three-year time span. In other words, it appears that the original "winners" would become "losers", and vice versa. Investing is both a science and an art. Keeping controls of ones emotions plays a large part in the outcome. "Individuals who cannot master their emotions are ill-suited to profit from the investment process"
"The investors chief problem, and even his worst enemy - is likely to be himself"
"To achieve satisfactory investment results is easier than most people realise, to achieve superior results is harder than it looks"
The Coalition Government has reiterated its position on a range of previously announced superannuation and tax issues, as part of the Mid-Year Economic and Fiscal Outlook. The next increase in the superannuation guarantee rate to 9.5% will be deferred for two years. A range of measures relating to the Mineral Resource Rent Tax that were legislated during the previous Government's tenure will be repealed. This includes the low income super contribution, income support bonus and school kids bonus. The 2015 personal tax cuts will not proceed. Benefits from the Government's Paid Parental Leave scheme will generally be paid by the Department of Human Services, not the person's employer. Efective 1 March 2014. The tax of 15% on earnings exceeding $100,000pa from assets held by a member in a superannuation pension will not proceed. - After much talk since May, the US Federal Reserve is finally reducing (or tapering) its asset purchase program - by $US10bn a month. - However, the Fed has enhanced its very dovish forward guidance, highlighting that interest rate hikes are still a long way off and dependent on the economy. - Fed policy remains market friendly & generally supportive of further gains in shares. - While, Fed tapering and speculation around it has and will contribute to bouts of market uncertainty, it should be seen as good news as it indicates the US recovery is becoming more sustainable. In what was perhaps the most anticipated event this year the US Federal Reserve has announced it will reduce the pace of its third quantitative easing (QE3) program by $US10bn a month. The Fed has been foreshadowing a “tapering” since May 22nd so it’s a surprise to no one. This note looks at what it means for US monetary policy and investment markets. A cutback in QE from $US85bn a month to $US75bn. This to be focussed on both reduced Treasury bond purchases (which drop from $US45bn a month to $US40bn) and reduced purchases of mortgage backed securities (which drop from $40bn a month to $35bn). More dovish guidance on the outlook for interest rates with the Fed indicating rates will remain near zero well beyond the time when unemployment falls below 6.5% and 12 of the 17 Fed committee officials not seeing a rate hike until 2015. In other words the clear message is that tapering is not monetary tightening and does not mean that the first rate hike is any closer. The Fed’s dovish guidance is significant as Fed research suggests it has greater effects on the economy than signals about asset purchases. * Specifically, it’s aimed at pushing back against rising bond yields as it has led to higher mortgage rates. The first thing to note is that the Fed’s move is positive as it indicates the US economy is getting stronger and the recovery more self-sustaining and so the US can start to be gradually taken off life support. However, the emphasis is on gradual. 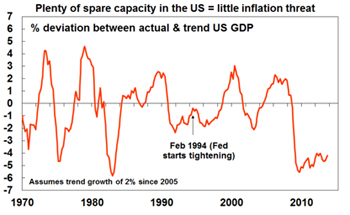 It’s quite clear the Fed is still committed to easy monetary policy until more spare capacity is used up. While the economy is on the right path, it’s still got a way to go, particularly with inflation running well below the Fed’s 2% target. In this regard, tapering is not the same as monetary tightening. Pumping cash into the US economy is continuing but at a slightly lower rate. It’s very different to the premature and arbitrary ending of QE1 in March 2010 and QE2 in June 2011 that went from $US95bn & $US75bn respectively in monthly bond purchases to zero overnight at a time when US and global economic data was poor and contributed to 15-20% share market slumps at the time. This time around QE is only being reduced gradually and only because the economic data shows the US economy improving. Growth is still far from booming. Spare capacity is immense as evident by 7% official unemployment, double digit labour market underutilisation and a very wide output gap (ie the difference between actual and potential GDP). A fall in labour force participation has exaggerated the fall in the unemployment rate. While much of this is structural some is cyclical and at some point will start to bounce back slowing the fall in unemployment. Inflation is low at just 1.2%. Comments during her nomination hearings quite clearly indicate that Janet Yellen, the likely next Fed Chairman after Bernanke’s term ends at the end of January, will not be rushing to raise interest rates. Put simply the Fed may be easing up on the accelerator, but they are a long way from applying the brakes. Finally, while the US is slowing its monetary stimulus this is not so in other key developed regions with both the ECB and Bank of Japan likely to ease further if anything. While the days of expanding US monetary stimulus are probably over, the message from the Fed remains market friendly. The pace of quantitative easing is slowing only gradually, this is contingent on the US economy continuing to strengthen and rate hikes are unlikely until 2015, at least. For sovereign bonds our medium term view remains one of poor returns. Despite the back up in yields, they remain low relative to long term sustainable levels suggesting the risk of rising yields and capital losses over time as the global economy mends. Even if bond yields stay flat at current levels they offer poor returns, eg just 2.9% for US 10 year bonds and just 4.3% for Australian ten year bonds. However, a 1994 style bond crash which saw extreme long bond positions unwound triggered by a sharp 300 basis point rise in the US Fed Funds rate looks unlikely. For shares, the period of dirt cheap share markets and support from ever expanding monetary stimulus seems over. More significantly, taper talk since late May has clearly made some nervous given the positive relationship between rounds of quantitative easing in the US and share markets, with many fearing that a move to end it will be followed by slumps as occurred after QE1 and QE2 ended. See the next chart. 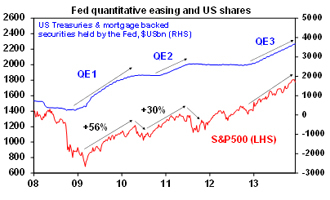 First, the tapering of QE3 is very different to the abrupt and arbitrary ending of QE1 and QE2. This time around US data is stronger and the wind down in QE3 is dependent on further improvement in US economy. Second, although the Fed isn’t undertaking monetary tightening many tend to see it as such so past monetary tightening moves, which have been via rate hikes, are instructive. The next table shows US shares around the first rate hikes in the past 8 Fed tightening cycles. The initial reaction after 3 months is mixed with shares up half the time and down half the time. But after 12 and 24 months a positive response tends to dominate. So even if this were the start of a monetary tightening cycle it’s not necessarily bad for shares. The reason for this lies in the improvement in growth and profits that normally accompanies an initial monetary tightening. It’s only later in the cycle when rates are going up to onerous levels to quell inflation that it’s a worry. Right now we are seeing improving growth and profits, but with the start of rate hikes (let alone rises to onerous levels) looking a long way off given very low inflation. Thirdly, the rally in US shares recently has been underpinned by record profit levels. It’s not just due to easy money. Finally, shares are likely to benefit from long term cash flows as the mountain of money that has gone into bond funds since 2008 is gradually reversed with some going to shares. While next year will no doubt see a few corrections in shares along the way, the key point is that the broader picture – of reasonable share market valuations, improving global growth and still very easy monetary conditions - suggests the bull market in shares has further to run. The Australian share market is also likely to benefit from the rising trend in global shares, but is likely to remain a relative underperformer reflecting better valuations globally and a bit more uncertainty over the Australian economy. Sector wise, mining stocks look cheap and best placed to benefit from the global recovery. In terms of the Australian dollar, Fed tapering may make life a bit easier for the RBA in getting the $A down. While I wouldn’t get too excited as near zero interest rates in the US look like remaining in place for some time, the broad trend in the $A is likely to remain down. Finally, in the very short term getting the Fed’s taper decision out of the way likely clears the way for the seasonal Santa rally in shares that normally gets underway around this week and runs into early January.